Holiday Gift Guide Part 3 - Accessories! We have lots of awesome accessories for men and women! Many of them are in the under $25 range so they are perfect for all of your friends! Just in! Queen Bee Creations line of handmade vinyl wallets - a must for your vegan friends! For the guys - leather wallets by Vault - choose from embossed images like hachets and screws. 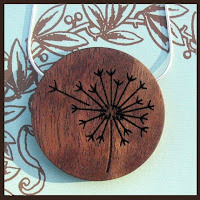 Carved wood necklaces by Garnish! Gorgeous! 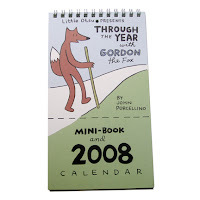 Planners and calenders in from Little Otsu including this one by Denver comic book artist John Porcellino! 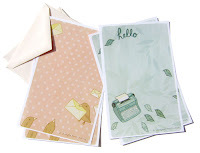 New cute stationary, recipe cards, and postcards by indie artist Susis Ghahremani of BoyGirl Party! We updated the needle felting class for the holidays and made adorable snowmen! Look at how cute! 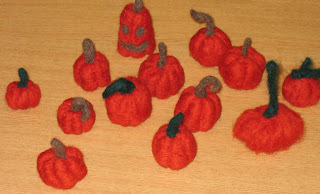 Next needle felting class is Dec. 15th so sign up soon to get in on the action! 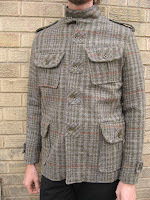 Super hot vintage military inspired jackets from Brown Sound. 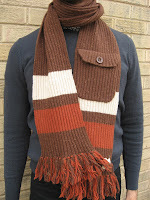 Extra warm wool scarves from Brown Sound. Pocket included! This jacket from LA Made completes any wardrobe. Adorable tops and dresses in stock from them as well! Hand printed one-of-a-kind pieces by Little by Jenny. We also have wish lists you can fill out and leave for family and friends if you see things that YOU can't live without! We taught two needle felting classes this week for the Denver Public Library's Fresh City Life program. Look at the glorious results! All those cute pumpkins! Holiday Gift Guide Part 1 - DIY Gifts! If you want to make your own holiday gifts this year, we have lots of fabulous kits and tools for you. 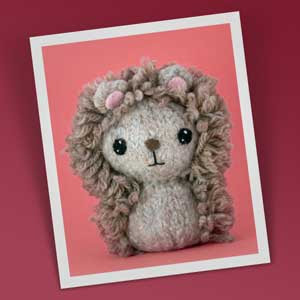 Here are some fun, new products that will make quick and amazing gifts - or give the kits as gifts to your crafty friends! 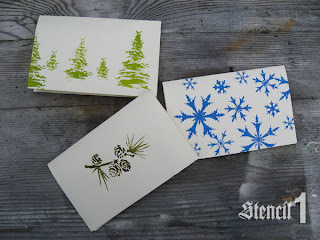 For making your own cards or wrapping paper, we have stencils in from Stencil 1 - four holiday/winter themed stencils per package. 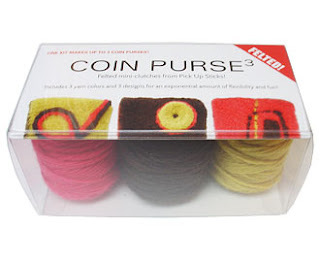 For the knitter, we have two different brands of felting kits - Pick up Sticks focuses on coin purses and zip pouches, and Crafty Alien makes adorable animal kits. 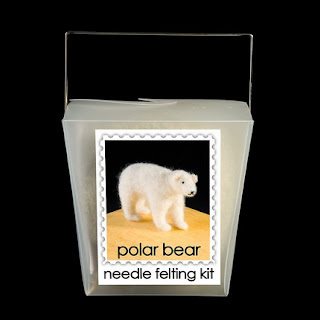 New needle felting kits in holiday themes such as polar bears and snow men - no experience necessary - anyone can do these! 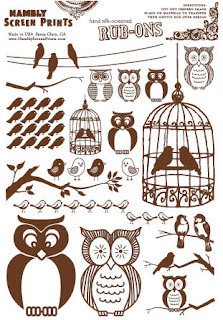 We also have new transfer rub ons by Hambly Screen Prints which can be used on glass, ceramic, paper, and more. How about making some soy candles using our soy candle kits ($6 makes 4, 4oz candles!) and then putting adorable birds on the candle glass! Cute, fast and made with love! Stop by for tons more ideas and kits for handmade gifts! As part of our Holiday Gift Series, we made block printed tea towels last night! It was a super fun class and you can see the variety of results! The holiday gift series is all about making hand-made holiday gifts in one hour. Each session is only $15. Next session - all natural soy candles! Holiday craft mayhem is what happens when you attempt to hand-make all of your holiday gifts each year. In an effort to help, we are offering a series of gift-oriented classes, each an hour long and only $15. Last night was handmade journals and they turned out so great! I've pictured a few here! It was so fun - be sure to sign up for a session - the next one is soy candles!